James VI. of Scotland, son of Mary, Queen of Scots, great grandson of James IV. of Scotland, by Margaret, daughter of Henry VII. of England. Born 1566. Crowned King of Scotland, 1567. Married Anne, Princess of Denmark, 1589. Succeeded to the crown of England, March 24th, 1603. First styled King of Great Britain 1604, when he came to London, being then in the thirty-seventh year of his age. Right glad was he to enter that southern "Elysium "-where he became freer from the somewhat harsh tutelage and control which had marked his earlier youthful experiences as King of Scotland. He was the son (as above said) of the accomplished and "voluptuous" Mary, and the foolish and debauched Darnley; his mother, during her pregnancy, had seen Rizzio assassinated before her face; he had for his tutor Buchanan, who made him a pedant, "which was all," he said, "that he could make of him"; he was a King at the age of one; and he continued more or less childish (according to contemporary chroniclers, of whom many have described his peculiarities and weaknesses) as long as he lived: at once clever and foolish, confident, and in some respects of no courage. A great hunter, this first of the Stuarts, clad all in grass green with a green feather; big head, slobbering tongue, rickety legs, quilted, "stiletto-proof" clothes, which he would wear to rags, none too cleanly in his person, addicted to drinking, not ordinary light French and Spanish wines, but strong Greek wines; "the bottle governed him; the favourite governed him; his horse and dogs governed him; pedantry governed him; passion governed him; and when the fit was over repentance governed him as absolutely." Thus has James I. 's character been summed up. "His shrewdness and learning only left him, in the phrase of Henry IV., 'the wisest fool in Christendom.'" "As it is atheism and blasphemy to dispute what God can do, so it is presumption and a high contempt in a subject to dispute what a King can do, or to say that a King cannot do this or that." From a Star Chamber declaration of James I., touching the "Divine right of Kings"; of which more was to be heard later in the reign of one of his successors. A breach firstly with the Puritans was followed by a breach with the Catholics: the outcome of which was "the Gunpowder Plot." Barrels of powder were placed in the vaults of the Parliament House, with the intent to blow up King and Ministry, on November 5th, 1605-a conspiracy that failed; Guido Fawkes (a soldier of fortune), Garnet, and others, prime movers in it, all being either killed or sent to the block. 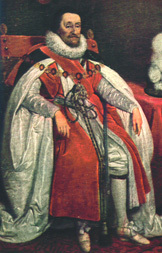 Buckingham, Bacon (the great Chancellor), and Carr, Earl of Somerset, were notable personages of this reign. James it was who beheaded Raleigh!